Discussion in 'General' started by DarkLord7854, 27 Jan 2010. Apple has launched the iPad tablet, just like everyone expected. I don't think I've ever been so bored at an Apple press conference.. not sure bout you guys but I saw nothing remotely innovative in what they made, and that bezel around the screen is utterly hideous IMO. - Enlarged iPod + iPod OS... a bit.. silly..
- 10 hours of battery life and over a month of standby..? Really..? That's it..? - 1Ghz Apple Chip.. I lol'ed at this. Anyways, the concept is nothing new (look at CES..) but I just don't see how this device is "magical" and "revolutionary" or even useful for that matter. I could make so much more use out of it if it had a real OS, and a 3G radio.. but this thing they came up with.. yea. 2. Nice UI, but would I need to interact with the iPad if there's nothing on it? I'm sure it'll be hailed by multiple corners to be the greatest thing to have happened to mobile computing since, well, ever. Me, on the other hand, don't really see what the fuss is about, just looks like they've decided to make a scaled up iPhone/iTouch and will now go about extracting more money from those people who will buy anything Apple produces and sticks an "i-" moniker onto. Would much rather have an Ion'ed up netbook any day of the week. .. and it will be overpriced because of it! I'm going to go home and play Perfect Dark on N64 and enjoy better graphics. "we've created the new iBook Store. You can download right onto your iPad." That was the highlight of the launch for me. Yeah.. That's probably the first MAJOR fail from Apple in the last couple of years. My god it's ugly and useless. And WTF is up with that bezel? Good design - it looks really neat imo, very swish. Even if it is a big iPhone, it still looks quite good. Too pricey, even for Apple - considering it's not that much cheaper for the base model than a full-fat MacBook. iPhone-style OS could be a big mistake - if it's too inhibited then it'll be crucially lacking in user satisfaction. Final thoughts - the ball is in MS' court to come good with the foldy thing. Good design - it looks really neat imo, very swish. Well said. I'll wait for an impartial review from someone who is neither pro, or anti, Apple. As usual with all Apple products though, overpriced. non contract mobile interwebnets <3. If i can get the 32gb with 3g for £600 then i'd quite happily get it. I was trying to be as neutral as possible; I don't like all apple products but I can appreciate why they're so popular. Contractless 3G is a good thing, but how do you pay for it? It is a lifetime free thing? 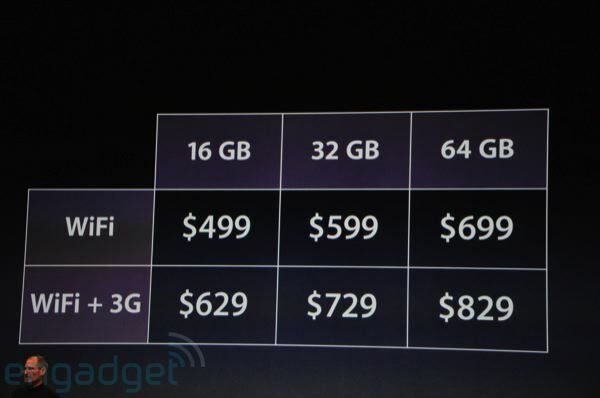 Ooh, different prices than the first news report I read; it's actually not too bad at $500 for the 16GB/WiFi. Pretty much what i was expecting: It's a large iphone. the tablet version of the asus eee is much better IMHO, much cheaper too. $499 for the basic model. So long as it translates to about £350 in the UK that's not too terrible. I'd still rather have an HP slate though. I have a Macbook Pro and a Windows machine, but I mostly run Linux. I love my Mac for what it does with Logic Pro and Aperture... But for 500$ this really isn't worth it especially since it's just 16GB with Wifi... Here's the quote up. So if you want the useful part of it, you're shelling out quite a bit IMO... If it was $500 with 3G I'd say it was a solid investment. Oh no, I wasn't saying you were pro or anti Apple. I just meant I'd like to see a full review, rather then the CEO who's touting it as the best tablets since the 10 commandments. Sadly, it isn't April 1st. I know, I was just stating facts for those who might be on the defensive/offensive - inevitable with anything new from Apple tbh.